One of my very favorite appetizers is jalapeño poppers. I love biting into all of that creamy, cheesy spiciness. My mouth waters just thinking about it! My go-to recipe for poppers is a baked version that has a little crunch thanks to a coating of panko breadcrumbs. 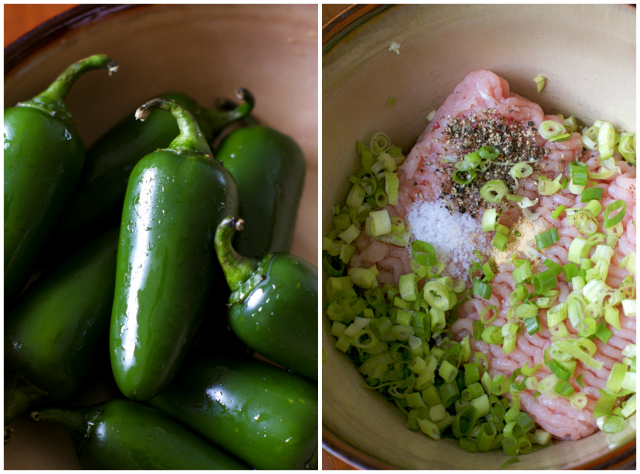 I seriously grow jalapenos in my garden just for that recipe. BEST. EVER. I love poppers so much that a few years came up with a jalapeño popper inspired burger that totally rocked my taste buds. For that recipe, the cream cheese jalapeño mixture is sandwiched in the middle of a burger patty. I threw some bacon on the burger, too, because bacon, burgers, and jalapeno poppers just make sense. My undying love for all things popper has surfaced once again with these irresistible little sliders. Turkey burger sliders, to be exact. But not just any old turkey burger, mind you. These babies are special. A very ooey, gooey, cheesy, spicy, bacon-y kind of special all served on a soft and sweet King's Hawaiian roll. We all know King's Hawaiian rolls are the king of the slider with their perfect size, perfect texture, and perfect taste! They were just right for my popper-inspired sliders. So, let me tell you about these delicious little guys! First, they are going to make an amazing addition to your tailgating menu. Prep them at home, pack them up, and watch the flocks of people crowd around your tailgate while you're grilling them to try to get in on a little piece of the slider action. Be prepared to win the award for best tailgate burger at the game. They are that good, folks. You'll start the prep at home. You can do all of the prep the night before! First, wash and bag up your fresh jalapeños. They'll be thrown on the grill whole. Easy! Then, mix up your burger mixture. Turkey, green onions and some seasoning. Simple and delish. Once you've got your burger mixture ready to go, roll it into little balls. Yes, they're going to be burgers, but the first step to a perfect bacon-wrapped burger is a meatball. Oh, did I mention yet that these burgers are bacon-wrapped? They are. You're welcome. Wrap the turkey meatballs in some bacon. One slice cut in half should fit around perfectly. Then you wrap the other half a slice around the meatball in the other direction. The meatball should be wrapped up on all sides with bacon. Like a cute little bacon present. Bacon should be involved with presents as often as possible, in my opinion. So, then you place the burger, seam side down, on a plate and smush it down with your hand. Voilà! Once you press them down, they'll be the perfect little slider shape. Now they're ready to hit the grill! Wrap them up and keep them chilled until it's time for them to hit the flames. Next, you'll prep your cream cheese mixture. I season my cream cheese with a combination of spices, and for this recipe, since the cream cheese mixture is used as a burger spread, I add a little mayo, too. Just a touch to make the texture just right. To make applying the cream cheese mixture to the burgers easier on game day, you'll go ahead and slap it all into a big baggie to store it until it's time to use. How does that make it easier for tailgating, you might ask? Let me explain! 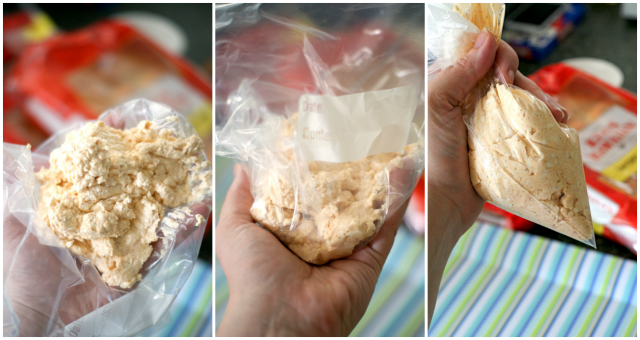 Fold the baggie over your hand, scoop the cream cheese mixture into the palm of your hand, then pull the baggie up and around the mixture. Zip it up, throw it in the cooler, and when your burgers are coming off of the grill simply snip off the corner and you've got a DIY disposable piping bag! No mess and no fuss when you're assembling the burgers. Yes! That's it for the pre-game tailgating prep! Not too bad, right? Fire up the grill and let the tailgating commence! The bacon-wrapped turkey burgers sizzle alongside the fresh jalapeños. You're on your way to the best turkey burger of your life, friends. Keep everything sizzling until the bacon is golden and crisp and the jalapeños are soft and charred. 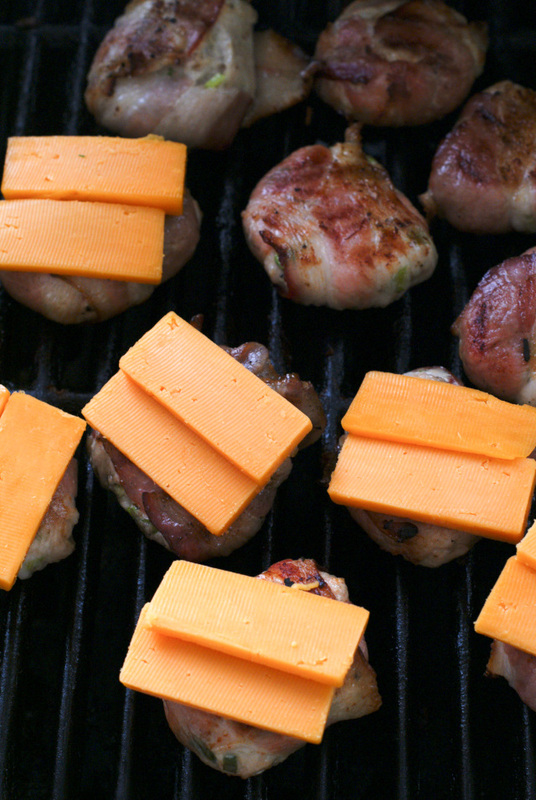 Throw some sharp cheddar on your little bacon-wrapped morsels so it gets nice and melty. I believe every good burger should be topped with a thick slice of cheese! While the cheese is melting you can slice the King's Hawaiian rolls in half to get them toasting on the grill. Cheese is melting, rolls are toasting, and now it's decision time. To seed or not to seed, that is the question! Do you like your jalapeños extra super spicy? If you do, when you take the stems off and split them open, leave the seeds in and put them on the burger just like that. If you're like me, a little heat goes a long way when it comes to jalapeños, so you'll split them open and scrape out the seeds before putting them on the burger. It's all about personal preference. Only you know how much heat you can handle! It's the final stretch now. 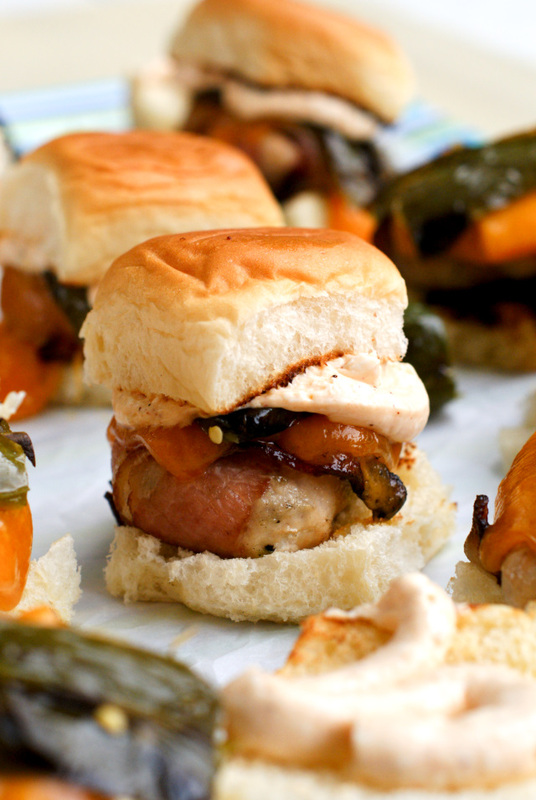 You are just moments away from the flavor explosion that is these sliders. Place the turkey burgers on your toasted King's Hawaiian rolls, top them with a slice of jalapeño, and pipe on the cream cheese mixture. Before you bite, though, grab a handful of napkins and a cold beer. They are necessary accompaniments for these little beauts. You will need the beer and the napkins. Trust me, y'all. So, there you have it. 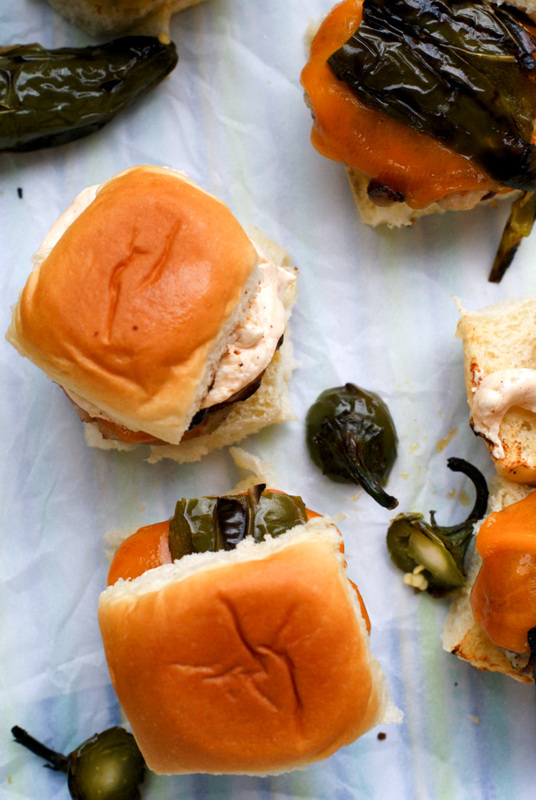 The best ever jalapeño popper-inspired turkey burger sliders! While you're getting ready for your tailgating extravaganza and shopping for your slider ingredients, may I suggest also picking up some King's Hawaiian Hot Dog Buns. I know y'all are going to have some brats and dogs while you're tailgating, too! To get more game day inspiration and other fab recipe ideas featuring King's Hawaiian, make sure to follow along on Twitter and Facebook. And I know you already know Pinterest is a goldmine of inspiration. King's Hawaiian on Pinterestdoesn't disappoint! 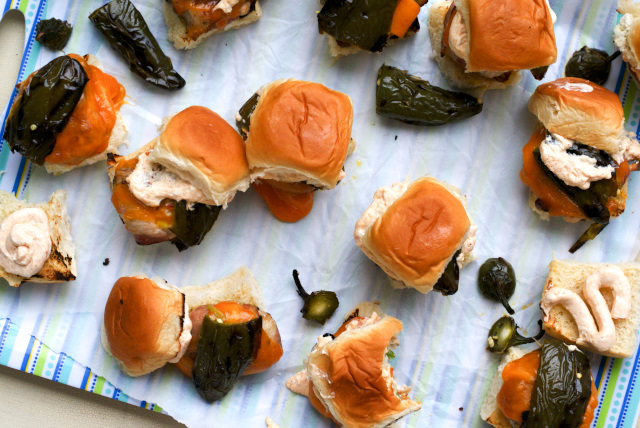 I hope you love these spicy, cheesy, flavor-filled sliders as much as we did! They will be the highlight of your tailgating adventures, for sure! In a medium bowl, combine the ground turkey, green onions, salt, pepper, and garlic powder until well mixed. Shape the meat mixture with your hands and form 12 equal sized meatballs. 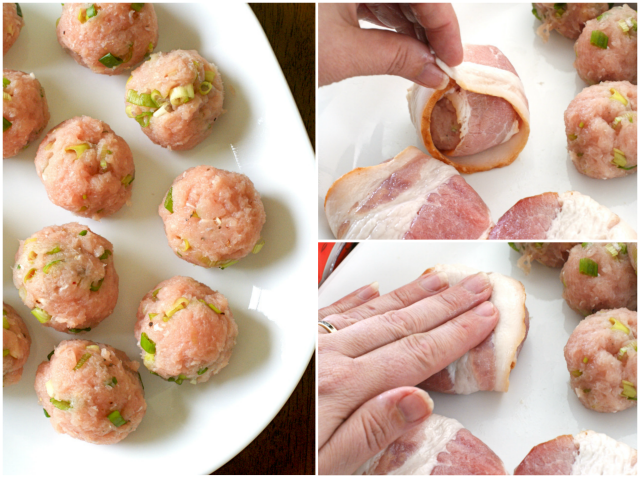 Wrap each ball with one half slice of bacon, and then another half slice in the opposite direction. Place the bacon-wrapped ball, seam side down, onto a plate and press with your hand to flatten into a burger. Repeat with the remaining meatballs. Cover and refrigerate until ready to grill. 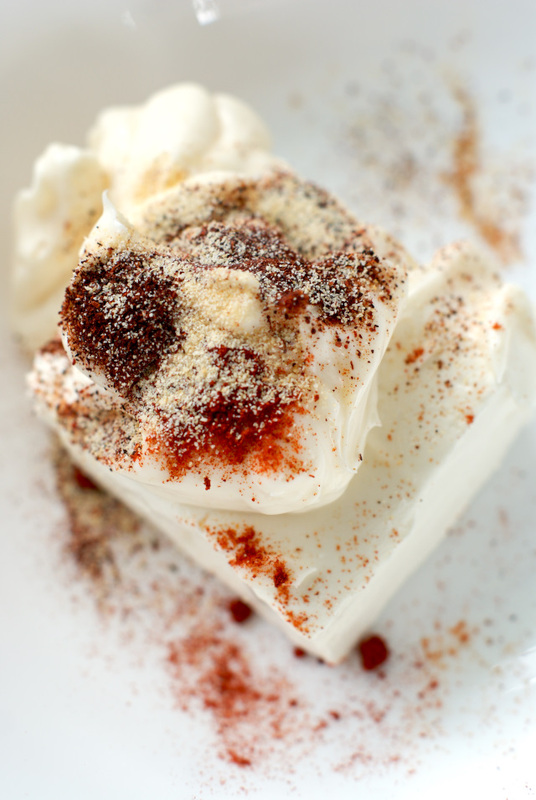 In a small bowl, combine the cream cheese, mayonnaise, paprika, garlic powder, and chili powder. Spoon into a plastic baggie and refrigerate until ready to serve. Preheat your grill to medium heat. 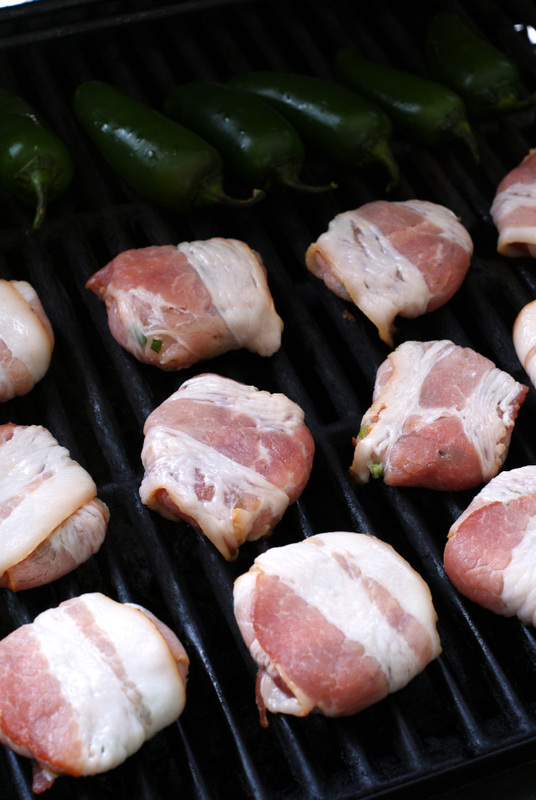 Place the bacon-wrapped burgers(seam side down) onto the grill. Flip the burgers after 5 minutes. Grill for another 5 minutes, or until the bacon is crisp. Top the burgers with the sliced cheese. Meanwhile, in a bowl, toss the jalapenos with the olive oil to coat. 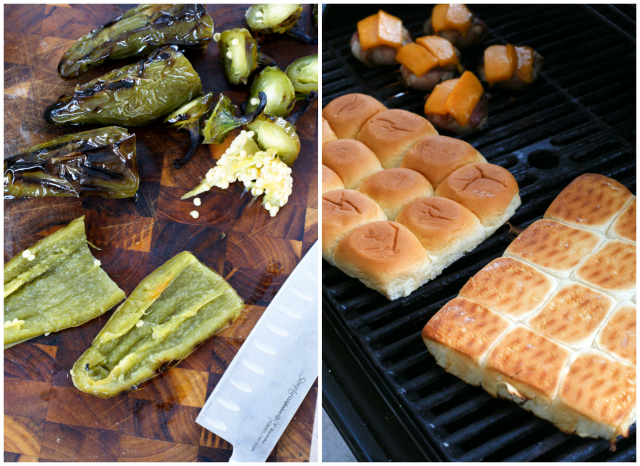 Grill alongside the burgers, flipping often, until the jalapenos are soft and charred. When cool enough to handle, slice the stems off and slice each one in half lengthwise to remove the seeds. Cut the King's Hawaiian Rolls in half and place onto the grill, cut side down, to toast. Pull the rolls apart and top each one with a burger and a jalapeno slice. Cut the tip off of one of the corners of the cream cheese mixture baggie and pipe onto the top bun. Grab some napkins and serve hot! Becky Tarala is a stay-at-home mom, vegetable gardener, coupon-aholic, cookbook hoarder, potato lover & blogger at The Two Bite Club. Her food blog features her well-loved collection of simple family-friendly recipes as well as her love for vegetable gardening and couponing.